Uh-oh, looks like we're in for another tragic week! A dumb guy calls his friend (Charles S Dutton, TV's Roc!) to share his worries. It seems the dumb guy took a kid to the hospital - possibly his son - and then stumbled outside, no longer capable of discerning fantasy from reality. The dumb guy's rantings involve him maybe beating someone to death in an alley, but he doesn't express them clearly enough to raise Dutton's concern. So Dutton merely tells the dumb guy to get some sleep since he'd had such a brutal fight earlier in the night. It seems Dutton should have listened, as right after hanging up the phone dumb guy notices that he's covered in blood! Not that he calls the police about it or anything sensible like that. The next morning Greg is out jogging when a woman decides to hit on him! Greg is a little uncertain about calling her, but later that morning he tells Joe about the situation, so despite his reticence he must subconsciously he must feel he's ready to start dating again. After all, why else would he tell someone who would no doubt push him into calling the woman? You know, for a minute there, I was going to hypothesize what reaction he would have been subconsciously hoping for had he confided in another member of the team, but then I realized that all of them are generically super-supportive of one another, so it really wouldn't have mattered. On to the briefing, where the team is told that tow men were beaten to death with pipes, then propped up on crates, and had their faces covered with cloths. The circumstances are bizarre enough that even with just a single clustered violent act, the team already thinks they need to be there. Which is more of an explanation than the show generally gives - remember those kidnappings they just leaped at the chance to help out with? We also get our first cheat of the night, as it's explained that the killer will likely escalate because he's clearly had a break from reality. Based on what? He beat some people to death with pipes, then - presumably wracked with remorse - he cleaned them up and put them in seated positions. How do you get completely psychotic and degrading from that? There are fugue states, he could have done it while high on a drug and then regretted decision - it could even be a gang with a strange initiation rite. At this point there's no way you can authoritatively guess that you're dealing with a killer whose mental state is rapidly failing. That is what they're dealing with, of course, as we learn in the next scene, where the killer contemplates his disturbing memories, showing in the form of flashbacks to a cap-and-glove wearing man beating someone do death with a pipe. But is he, in fact, the killer? We don't see any faces in the flashback, but he's obviously wearing the same clothes, so it would be a stretch if the show tried to pull a twist on us. There some gossip on the plane about Greg dating, but then they move on to the details of the case. Both men put up good fights, so their attacker had to be fit, and the two men probably knew each other, since they were in a desolate part of downtown late at night, and one of them was carrying two orders of food when he was attacked. It's a little weird that they're extrapolating familiarity based on that minor piece of evidence, rather than conversations with relatives and an examination of who the guys were/what they were doing there. Later that day the killer is training with Dutton. He needs cash for his sick child, and suggests that he should try some manner of MMA dueling. Dutton insists that he buckle down and train for a fight that's going to be happening tomorrow... hold on... the killer had a 'rough fight' on the same night he killed those guys, and according to Garcia's case rundown this morning, that was just twelve hours earlier. And now the killer has another fight the next day? Is that normal/plausible? While it's true that my knowledge of boxing comes solely from the movies I've seen about boxers (which is a surprisingly large amount of movies, now that I think about it...), but do fighters generally have two bouts in three days? I know he's a low-rent slugger and has to make as much money as he can for his dying child, but doesn't it generally take more than 48 hours to recover from the effects of a brutal beating? Am I the crazy one here, or does Criminal Minds not know what it's talking about? Down at the crime scene Derek and JJ use extremely circumstantial evidence to determine that the killer attacked one man, then dragged his body into a darkened corner so he could take the other man by surprise! Which demonstrates a kind of planning inconsistent with a psychotic break! It's an interesting theory, but once again, they're jumping to conclusions unsupported by the facts. Isn't it just as likely that the killer - seeing as he was armed with an iron pipe - was able to subdue the first man relatively quickly, and when the second man heard the ruckus he came running to rescue his friend? Then the bodies were only dragged off after they were killed? That would certainly explain how the two large and physically capable men were defeated by a single attacker. Oh, and it turns out my theory is correct because it's not actually my theory, it's what we saw in the earlier flashbacks. That's a picture of the first man already beaten into submission when the second man arrived to stop the murder. So no, JJ and Derek, no one dragged anyone into an alcove so that they could spring an ambush, Splinter Cell-style. You know, they still can't even be sure that it was just one attacker at this point. Both murders were committed with a pipe, and the thing about pipes is that they tend to be uniform in size and material. It's kind of an important part of their design, actually. And since the majority of the beatings that both men received were while they were prostrate, there's be no way to forensically extrapolate the attacker(s) height. The most you could likely get is whether the blows were struck by a right or left-handed person - but since the killer is a righty, like the vast majority of the world, there'd be no way you could eliminate accomplices based solely on the preposterousness of two left-handed people teaming up to pipe-murder some guys. I'm just playing devil's advocate here - we know that the killer is the killer, unless the flashbacks are lying to us - but I think it's important to point out from time to time just how terrible these people are at their jobs. They do notice that the only thing in the area open late at night is a nearby hospital - so the team isn't completely useless. Although if the victims had a reason to be in the hospital after midnight you'd think their families/work might have known about it and told the cops. Now some sad family stuff with the killer. The son is sick in the hospital, and his recently-divorced parents can't convince him to eat anything because of his upset stomach! Then a doctor drops by to let them know that the son's leukemia has returned, and his chances of survival aren't great. The killer wants a bone-marrow transplant for his child, but the doctor seems dismissive. Is it about a lack of money - despite the fact that they have medical insurance and the doctor talks about running tests, the killer seems to think so! You haven't established that! How have you established that!? All you know is that Chinese food guy was probably the first target, and other guy just stumbled onto the attack. What are you basing your conclusion that Chinese food guy wasn't the focus of the attack on? Absolutely nothing? I thought not! The killer heads to a bar and meets Dutton. He wants to his trainer to put a bet on the fight, and he's sold everything he can manage to get the money together! The really depressing part of this interlude? He only has fifteen hundred dollars to bet. No matter how big the odds against him are, the winnings would come nowhere near paying for the transplant. Let's say somehow the odds are 20-1 against. For that to be the case his opponent would have to be a literal Terminator, but we'll still give the odds. If the killer miraculously wins, he walks (or stumbles, really) away with a 30K. A tidy sum, to be sure, but something like ten percent of the total cost of the treatment and operation. So yeah, bleak outlook this week. Then the next guy down the bar makes fun of the killer for being legendarily terrible, which just ignites his fuse. Who will bear the brunt of the killer's fury? The man who slighted him, or an even more innocent stranger? Reid has a theory about the killer - since the second victim was hit a lot more than the first, the killer must be learning to love murder! This all plays out in a scene that is a master class in terrible Criminal Minds writing. From the opening of the door, where Derek weighs in on a conversation that he couldn't possibly know the subject of, through their diagnosis of blood fetishism, right to Derek's insane capper, there's nothing that's right about this scene. The most important part, though, is Derek's puzzlement at the fact that a man who likes killing wouldn't have done it again immediately. Do you have a hamburger at every meal, Derek? I've talked a lot in these reviews about the absurdly compressed timeline the show depicts, and how we're presented with killers who have - at most - a week of downtime between murders. Now Derek has just gone whole-hog, suggesting that it's weird that a killer wouldn't' murder someone every single day, if he likes killing so much. Not only does this have no basis in psychology or the history of serial killers, it serves to - every single week - make the police response to these murders look woefully inadequate. For all their stupidity, however, these characters certainly are observing and following the rules of the world they live in, since in the very next scene the killer attacks the guy who made fun of him in the bar, as well as another man who just happens to be in the parking lot at the same time. Okay, so a guy mocks a professional boxer, and then an hour later someone beats him to death with their bare hands. Easiest solve ever, right? How are we only fifteen minutes into this episode? Reid talks a little about how neurons misfire after an energetic killing, causing people to have visions, which is nice and all, but no one is focusing on the big question - why aren't his hands shattered? 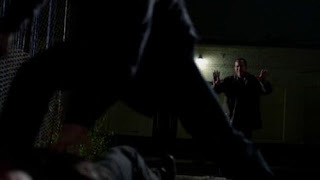 Earlier this season they were able to diagnose a killer with analgesia solely because he beat people to death with his bare hands, which were no doubt shattered during the encounter. This killer performed even more severe acts of violence, but he's apparently not at all phased - and none of the characters are mentioning it. Here's the other thing I know about boxing - before gloves were used there were fewer fatalities in boxing because gloves don't protect the person getting hit, they protect the striker's hands. It's incredibly hard to punch someone in the head without damaging your hand, so old-timey bare-knuckled boxers hit each other in the torsos to protect themselves while wearing down their opponents. Which is my long-winded way of saying: this man crushed two other men's skulls with his bare hands, and we're expected to believe that he's fine? How? Also, why did the team wait until the next morning to check out the crime scene? When the murder victim left the bar, there were still plenty of cars in the lot, meaning that there were still plenty of people inside. So it couldn't have taken long for the bodies to be discovered - why wasn't the FBI brought in the moment the cops discovered they had a new brutal assault? Wouldn't they want to see as fresh a crime scene as possible? Or is getting a good night's sleep that much more important? Meanwhile the killer is hallucinating about his dying son, and so exhausted that he winds up collapsing in the locker room of his gym. Can his fight possibly go well? Apparently so, since he knocks his opponent out in the first round! This scene has the profile played over it, so we learn that the team attributes his new success in boxing to his obsession with seeing blood. Which is such a stretch I don't know where to start. Do you know how many cases you've seen where people were beaten to a pulp without you extrapolating that blood aroused the killer? I'll give you a hint - it was all of them. All of the cases with pulp-beating. Finally some decent evidence turns up, as the coroner lets Joe and Emily know that the victims had injuries to their eyes and kidneys, so the killer is punching in much the way a boxer might - not that anyone says it. Although they should definitely clue to the connection when they remember that a well-known local boxer was in the bar shortly before the murder. They know that, don't they? From when they interviewed the bartender and patrons? They did do that, right? More depressing slog in the killer's life, as he learns that Dutton bet against him - he was overmatched, and Dutton was just trying to ensure that there would be money for his kid's operation. The killer is not heartened by this reveal. And neither am I. Let's say that the killer was getting fantastical 20-1 odds. That means that Dutton's bet would have transformed the killer's paltry 1500 dollars into a princely 1575. Is it even worth betting with that payoff? With even more anger in his heart, it seems the the killer is likely to head out and commit more violence! But against who? Probably the mobster who's been taking Dutton's bets all this time. Yup, the killer goes to confront the mobster about his suspicion that Dutton's been betting against him, and the mobster confirms that it's been going on for his entire career - the killer has always been a loser that Dutton puts up against people far better than he is so that tiny amounts of money can be made when he loses. In case you're wondering, no, this doesn't make a lick of sense. First off, the mobster obviously has to be in on the scheme, since there'd be no reason to take Dutton's bets otherwise - betting against your own guy is a pretty big no-no in the illegal gambling world, unless you've colluded to throw a fight. Here's the thing, though - what's in it for the mobster? Dutton's racket is that he has the killer try to punch above his weight class, and then lose. This I understand as a concept, you need some scrubs in the mix to buttress the W/L records of future champs, but how can betting possibly turn anyone a profit? The killer is a well-known loser - so the odds against him winning must always be pretty long. So how is anyone making money betting on these fights? Who would bet on a famous 'punching bag' except for the occasional sap with a fondness for long shots? You know, it's every bit a betrayal for the killer to find out that for his entire career his trainer has been taking bribes to put the killer into the ring with people he had no chance against, specifically to help those guys' records. It also wouldn't have been terrible writing. No part of this plot makes sense. Especially the part where the killer attacks the mobster, and the mobster's bodyguard doesn't just shoot him in the back while he's punching. Luckily the show cuts to black so we don't have to see them try to explain that preposterous contrivance. Hopefully Garcia will make this all better by identifying the killer now that the team has asked her to check out Philly's boxing scene. How did they figure that? By combining the ME's description of the injuries with the fact that the killer posed the first two bodies like they were in separate corners. Or, you know, maybe they just asked themselves the basically rhetorical question: "Who can beat multiple people to death with their bare hands?" 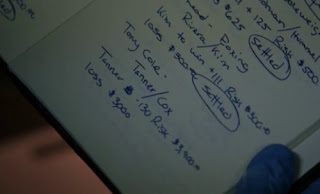 That's the bookie's ledger for Dutton's bets. Forget my fancifully optimistic guesswork - the killer was only a 3-1 underdog. Dutton was nice enough to match his bet, but even if he'd bet the right way there would have been just 9K to put towards medical costs. Had the killer lost, as Dutton hoped, there would have been four thousand dollars to go around. What's that, 1.5 nights in a hospital? Also, in the prop it says that the fighter's last name is 'Tanner', but we're told that it's 'Jimmy Hall', which is probably just a thing where they had to change a character's name at the last minute for legal reasons and didn't have time to fix the prop. Anyhoo, the team notices that the ledger was open to Dutton's page, and since he bet far more than his normal amount, they assume that he's got to be the killer! Garcia looks in to Dutton, and nabs them an address. But even if that were all hundreds, it would only be around the 30K we discussed earlier, and he'd be laughed out of the hospital. Besides which, the son is too weak for the transplant, and the killer gets the news that his little boy won't survive for much long. Sounds like it's time for another murder, or at least an attempt. Dutton this time? Actually, Dutton's already kidnapped or dead - by the time Joe and Emily get to his apartment (no warrants are mentioned, naturally) the place has been trashed and Dutton is missing. Could the killer have dragged him somewhere else? The team thinks so, and figures that the only person with the strength/motive to do so would be one of Dutton's boxers, but a large question goes unanswered. How did no one hear any of this? We're expected to believe that Dutton - a man with 60 pounds on the killer - put up enough of a fight that his living room was trashed, and held onto the door jamb so tightly while being dragged into the hall that he broke the wood, without anyone noticing? Then the killer dragged Dutton down a staircase and out to a car without anyone calling the police? In what world? I don't know if you've seen Alien Cubed, but Charles S Dutton is huge. The killer then tries to comfort his dying son, but he gets distracted by his arousal for the bag of blood hanging over the bed, so he heads out to murder Dutton. Meanwhile JJ and Derek wind up at Dutton's gym, and find out that among the people he manages is the killer, and they assume he must be involved since it was his fight that Dutton lost big money on the previous evening. Oh, and the other boxing guy dismisses the illegality of betting against your own fighter by saying that 'money's tight'. Yes, and betting against a professional loser won't help with that. Moron. Not that anyone would take the bet if he was your fighter. Does no one in this world know what a fix looks like? They find out about the killer's childhood history of violence, and then assume that he went into boxing to deal with his violent tendencies. They run into the ex-wife at his apartment, and she tells them about the dying son, which gives the team the triggering incident they love so well. She also mentions that he was going to see Dutton when he left the hospital - which leaves just one question left this week: can they figure out where the killer has Dutton locked away before he kills the old man off? Probably - but I'm excited to see how! The team assumes that the killer will go looking for a fight that very night, since he famously tries to cheer his son up by beating on people in the ring. Figuring that his bad experience with his trainer will keep him from straight boxing, they pass on the one underground fight that night and go to two MMA bouts instead. You know, you have enough people that you could just check out all three venues. Why not cover all the bases? Seriously, is there a reason you're not doing that? Also, this is three professional fights and four murders in four days. Does any part of that make physical sense? 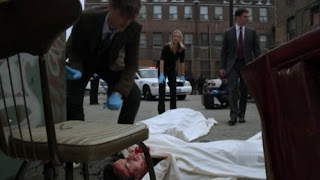 Anyhoo, the killer gets beaten to a pulp, and the team takes him to the hospital. They want him to reveal Dutton's location before they'll let him see his son. Oh, sorry, that's what I assumed they'd do. That's what they'd do in a sane world. No, Greg isn't interested in all in the missing trainer - he only wants to make sure that the killer successfully cheers up his son before going to prison and never seeing the kid again. How are you this bad at your job, Greg? So the killer comforts his son until the kid dies, and then we cut back to Quantico, where we discover that Dutton's corpse was discovered some time later. Greg goes on a date afterwards. I'd give them partial points, what with the figuring out he was a boxer, but then that didn't actually help them solve the crime, so it's kind of a wash.
A well-known local boxer is sitting in a bar. A lout insults the well-known local boxer, and the well-known boxer storms off in a huff. A short time later the lout is beaten to death with the bare fists of a man who had been lying in wait for him outside the bar. Do I have to draw you a diagram, people? This isn't exactly Murder on the Orient Express. Honestly, I almost gave this episode a 0/10, and here's why - it's the story of a guy who finds out his kid is dying and quickly circles the drain. Whether the team found him that night or not the killer would have lost his MMA fight badly and wound up in the hospital. In any event his son would have been dead in the morning, taking away all of the guy's motivation. At that point it's basically a 50/50 split between the guy killing himself and turning himself in to the cops. Or, you know, getting murdered by the mob because of that bookie he killed. So, realistically, had the team not bothered to show up, would this have gone any differently? They didn't even save the final victim! Although Charles Dutton is not an attractive woman, so I guess he wasn't a priority. It seems like all they accomplished was to get a murderer to have a last heart-to-heart with his son. Which is sweet and all, but not really what they're being paid to do. Thank you so much for posting this it made me laugh ,and also think . I did think it was strange they didn't save the final victim , I really disliked this episode ,but this brought a comedic aspect to it.